1.1 What should you be looking for in a table saw? 1.2 What safety features does it offer? 1.3 Does it have interchangeable blades? 1.4 Have you read any customer reviews? If you are putting together a workshop in your home for your DIY projects, then one piece of kit that you should definitely consider investing in is a high-quality table saw. These pieces of machinery can seem daunting, but if you want to get the best results, then you will definitely appreciate having access to one. If you are still debating whether or not you need to install a table saw into your home workshop, then you are probably wondering about what benefits you can take advantage of. What may surprise a lot of people is that there are actually many. Let’s take a look at a few of the plus points that come with having access to table saw in your home workshop. Cut perfectly straight with ease – If you have tried completing DIY projects at home by using a standard manual saw, then you will have no doubt noticed that accuracy is not easy to achieve. You can mark straight lines with a marker but following them is incredibly difficult. One of the best things about an electric table saw is that you are almost guaranteed to cut perfectly straight lines every single time. 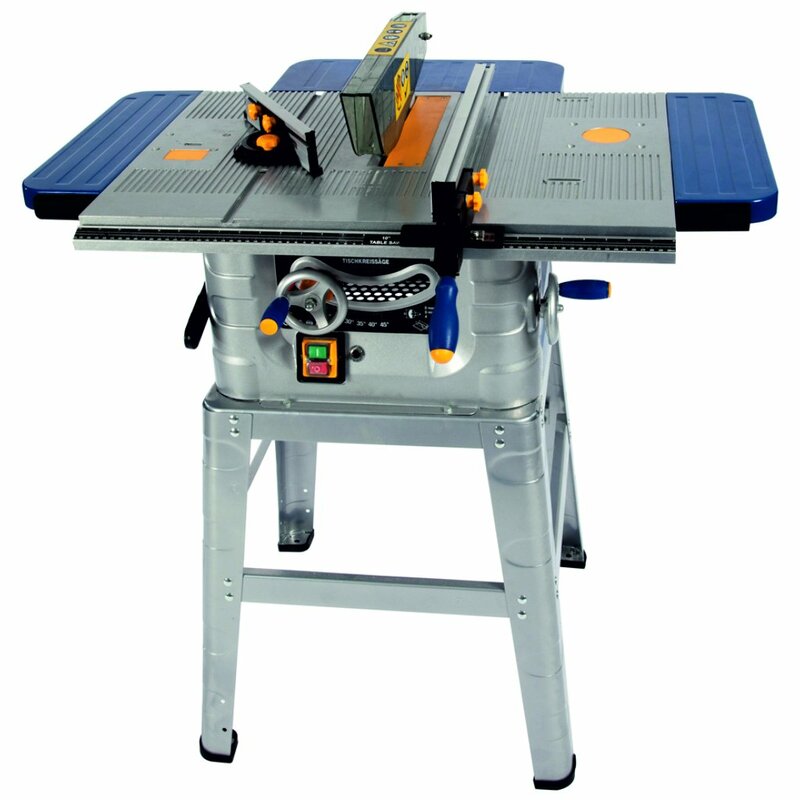 If you want your DIY projects to have a professional finish, then a table saw is going to be indispensable. Cut intricate slots – If you are trying to make furniture from scratch, or you are completing another DIY project from scratch, then it is highly likely that you are going to need to have slots cut into the wood so that it fits together properly. Again, trying to do this with a manual hand saw is very difficult indeed. With a table saw, however, this is a relatively simple process. If you are thinking about complicated home DIY projects, then a table saw would be a worthwhile investment. Save a lot of time – Whether the DIY that you are carrying out is complicated or simple, the fact is that using a hand saw not only takes a lot of strength and stamina, but it can also make things take much longer. One of the biggest advantages that you get with an electric table saw is speed. You will notice that you are able to save yourself a huge amount of time when cutting things. What should you be looking for in a table saw? When it comes to buying a table saw for your home workshop, there are a few things that you should be looking for, in order to make sure that your money is being spent wisely. There are hundreds of table saws on the market right now, so you will want to make sure that you have made a good buying decision. Here are a few factors to consider. What safety features does it offer? This is a very important factor to keep in mind. It is important to remember that table saws are powerful pieces of equipment, and they can be lethal if they are not used properly. When it comes to searching for a table saw, one of the things that you need to look for is what safety features it offers. Most of the saws on the market at the moment will offer at least some sort of safety features but choosing one all depends on the experience that you have. If you have never used a table saw before, then it would be a good idea to choose one with several safety features. Does it have interchangeable blades? This is another point to consider that many people seem to forget. Different types of projects are going to require different types of blades. For example, if you are trying to cut intricate parts into a piece of wood, then a large blade is not going to be suitable for the job. There are a lot of electric table saws that will have interchangeable blades. If you plan on using your table saw for a variety of projects, then it would be wise to take a look at these types of saws. By doing this, you can make sure that you have access to the right tools for your project. Have you read any customer reviews? When you are buying DIY equipment like this, it is always a good idea to read customer reviews. By doing this, you can make sure that you end up with a table saw that you are completely happy with. If you don’t read any customer reviews that have been written by people who have tried and tested the saw, then there is always the risk that you will end up with a saw that is either not suitable, or that you are not happy with. To give you a few suggestions, we have compiled a list of our top 3 table saws on the market right now. Take a look at them and see if any of them seem like they would be suitable for you. This table saw from VonHaus offers some impressive features for DIY enthusiasts to take advantage of. To start with, it has a cross stop with an angle that allows you to make cuts with the highest amount of precision possible. If you are working on an extra large project, then you will be happy to know that both sides of the table can be extended so that you can work on them safely and maintain precision when making cuts. With a quick clamp secure fence, you are able to keep the wood completely secure whilst sawing, making it as safe and precise as possible. 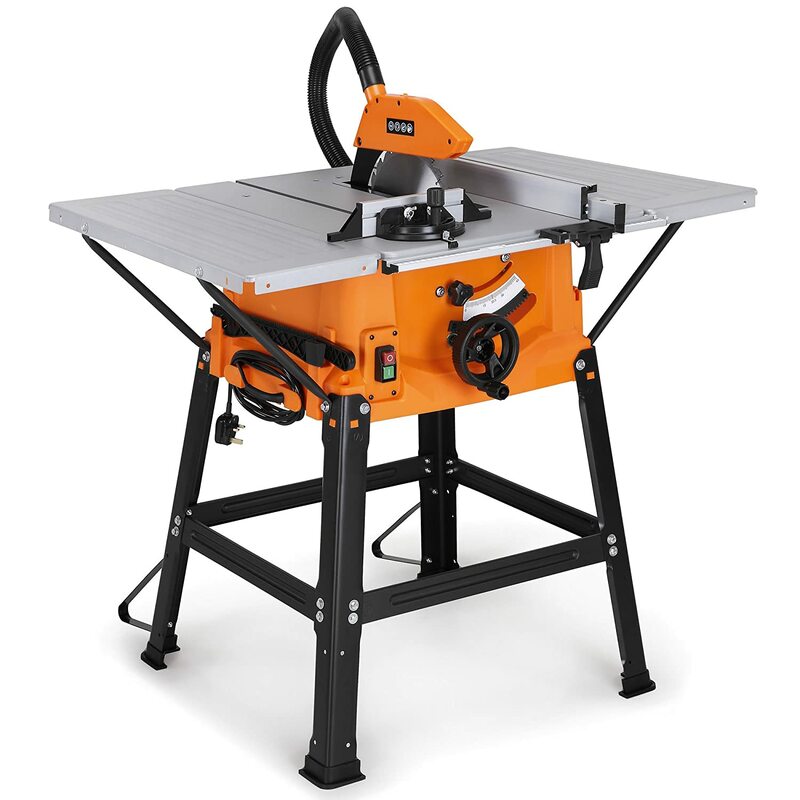 For a start-up table saw, this one from VonHaus is a great option to consider. “Just finished using it for cutting laminate flooring. This piece of kit is amazingly good, I was very surprised at the high standard of build quality. The angle cutting guide is of very good quality as well and extremely useful. This table saw from Fox is incredibly versatile, and perfect for use at home or in the workplace. This particular table saw is an improvement on previous models, and there are plenty of new features for users to take advantage of. It has two removable and adjustable side panels, so that you can extend the work surface for larger projects if necessary. It has a 1500W motor, which whilst it is not as powerful as the previous saw, it does make up for in terms of the features on offer. 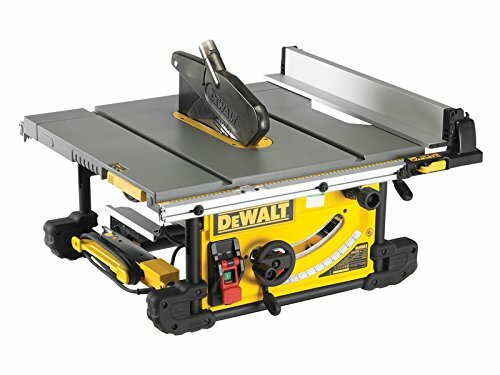 For a more compact option, this table saw from Dewalt is certainly worth considering. What it lacks in size, it certainly makes up for in power, with an impressive 1800W motor. It has an overload protection system, making it very safe. The blade itself has a steel roll cage which protects it from damage if it is jolted or dropped, which makes it perfect for use in both the home workshop and the professional workplace. The fence system can be adjusted so that larger projects can be cut with precision. Finally, it offers a quick bevel lock so that your work can be kept secure during the cutting process, leaving minimal room for error. If you want precision and don’t have a lot of space in your workshop, then this is definitely a table saw that is worth considering. “WOW! T’is a beast. Upon hearing this monster roar for the first time I felt a little intimidated but quickly realised the controls are quite intuitive. The fence locks solid enough for me to be able to gently pull the saw’s 22kg’s along the kitchen table where it currently resides, the wife now hates me, hehehe. The tilting and lifting mechanisms for the blade are easily accessible and can be operated with one hand. The push stick storage space is perfectly positioned on the rear of the fence where it is easily and quickly accessible. Whatever it is that you are looking for in a table saw, any of the three options above are worth considering. They are all packed with features and would all be well suited to both the workplace and the home workshop.